Climate Justice Activists from Around the World Show Solidarity with Philippines | Democracy Now! Among the many protests at the United Nations Climate Change Conference was a solidarity action with the Philippines, which was hit by Typhoon Hagupit over the weekend. Some 900,000 people were forced to evacuate. We speak with participants from Chile, Africa and New Zealand, who all say the negotiators at COP 20 are taking positions that fail to reflect the urgency that is needed to address climate change for countries that are already being impacted. AMY GOODMAN: We end with the voices of people speaking out, just behind us, because it’s happening all day, actions that are taking place around the issue of climate change. ANGELA VALENZUELA: Well, I’m Angela. I’m from Chile, and I represent Earth in Brackets. Every year in the Philippines, it’s being hit by a typhoon, and in the negotiations, they’re taking decisions that are not reflecting the urgency that is needed, that they are not reflecting climate justice. They’re not—developed countries are not committing to their historical responsibilities to address the problem. They’re indeed avoiding their commitments. RACHEL DOBRIC: My name is Rachel. I’m from New Zealand. AMY GOODMAN: What’s happening in New Zealand around climate change? RACHEL DOBRIC: In New Zealand, our government is just generally not having ambitious enough climate policy, so we’re continuing to lobby them to actually consider upping their ambition. AMY GOODMAN: And what group are you with? RACHEL DOBRIC: I’m here on my own. 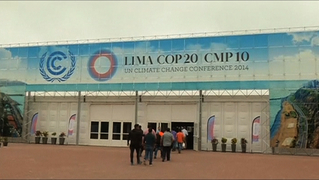 AMY GOODMAN: Ah, OK, you came all the way to Lima, Peru, from New Zealand? Why? RACHEL DOBRIC: I’ve been coming to these negotiations since Copenhagen, and I think that it’s important that someone’s keeping an eye on our government and someone’s actually reporting so that people at home know what’s happening. BLESSING MUTITI: So, my name is Blessing Mutiti. I’m originally from Zimbabwe, but I’m staying in South Africa, and that’s where I’m working. Climate change is affecting Africa in every way in our daily lives. Some areas, you don’t have food to eat. Some areas, there are floods. Some areas, people are just in dire poverty. And some areas are affected by the negotiations in the fact that we speak about mitigation and adaptation, but actually there is no willingness to put money into an adaptation fund. And we find these families and people still in problems around flooding, and there is no help to actually alleviate that poverty and those problems. AMY GOODMAN: People speaking in solidarity with the people of the Philippines, hit by Typhoon Hagupit.